As we all know about Jio offers. Craze of jio offers are fascinating users. Jio’s offers, features and fast net speed exciting people. But as it offers net for 4G phones, many users who dont have 4G phones are disappointed. There is no need to be disappointed because you can enjoy jio offers on your own phone with some changes in your phone. In this article we will discuss how can you use Reliance jio 4G sim on 3G smartphone. A few days ago this offer was available only Reliance and HP employees, buying new LYF phone, Samsung, iPhone. But now this offer is available for all 4G smartphone users. As per the latest news Reliance Jio 4G SIM preview offer open till 31st December 2016 for all 4G smartphone users. With the help of this article you can use Reliance Jio 4G SIM on your 3G smartphone. you can get free access of 4G internet, using VoLTE voice calling, video calling feature and also send free sms till 31st dec. 2016. Before few days this offer is available only for Reliance and HP staff members or LYF phone or Samsung iPhones. But now as per watching the huge interest company also provide this offer for different smartphone’s. Before using this procedure, check your smartphone runing on atleast android Kitkat 4.4. YOu have to also check that your smartphone’s chipset is whether of MediaTek or Qualcomn Processor because process in both processor are different to run 4G sim in 3G phone. First we are giving you steps through you can check your device’s chipset. step 1: At first download and install CPU-Z App from play store. step 2: Now open this app and wait for load your device information. step 3: Then you will see your device Soc(chipset) details. 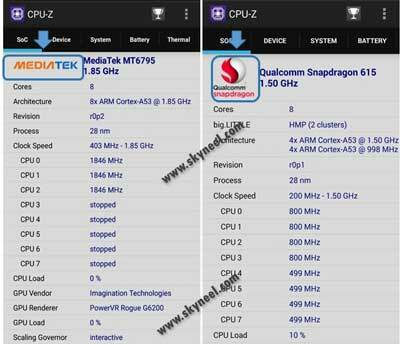 step 4: If your device is using Mediatek Chipset then it will show the Logo of Mediatek Chipset on the screen and If your device is using Qualcomn Chipset then it will show the Logo of Qualcomn Chipset on the screen. Now you knew about your device chipset then two different methods for both chipset. Note: You activate your Jio sim before using this guide. step 1: At first download and install MTK Engineering Mode app from google play store. Step 2: The MTK Engineering Mode App allow you to run Advanced setup of MediaTek devices. Now open this app and click on MTK Setting. Step 3: click on Preferred Network Option and Select 4G LTE/WCDMA/GSM as network mode. then save it and exit this app. Step 4: Once you done all steps successfully, shutdown your device and insert JIO SIM in sim slot 1st and keep sim slot 2nd empty. Step 5: Now turn on your device and you will see JIO SIM network on your 3G smartphone. if your device doesn’t show jio sim network don’t be tensed, just wait for 10 minutes it will show jio sim network and now enjoy jio sim unlimited preview offer till 31st dec on your 3G. Note you can enjoy jio offers but you will not get 4G speed on your phone as you are using 3G phone. Method 2: Qualcomn Devices – Use Reliance Jio 4G SIM on 3G smartphone, . step 1: At first download and install Shortcut Master Lite App from google play store. step 2: The Shortcut Master Lite App allow you to run Advanced setup of Qualcomn devices. Now open this app and click on Menu ( Top right side vertical Three Dots). step 3: Now go to search for Service Menu or Engineering Mode . Here you will see System App, select it. You will find Preferred Network Option, open it and access to change LTE Bands. Step 4: If this procedure doesn’t work on your 3G smartphone don’t worry then go to dialer and dial *#2263# then Select Menu. Step 5: Now go to Key Input And Enter 0000(four time zero) and wait for 10-15 seconds. you will show a Popup. Step 6: Now select UE Settings option>protocol >> NAS >> Network Control >> Band Selection >> LTE Band >> Band 40. Step 7: Once you done all steps successfully, shutdown your device and insert JIO SIM in sim slot 1st and keep sim slot 2nd empty. Step 8: Now turn on your device and you will see JIO SIM network on your 3G smartphone. Now enjoy jio offers on your 3G phone having 3G speed. I hope you like this How to use Reliance Jio 4G SIM on 3G smartphone guide from which you will be able to easily use Reliance Jio 4G SIM on 3G smartphone without any extra efforts. If feel any problem in this guide then please use comment box. Thanks to all. im using samsung note3 neo sm n750, which is 3g enabled handset. thus guide me how to change band to lte or volte. Yes you can use jio sim on Your device, help of this guide. I have Samsung k zoom device and it has exynos 5260 hexn chipset. ..
this guide working only MTK and SD chipsets. I’ve tried both options it doesn’t work. Note: Moto g 2nd gen, qualcomn processor, Marshmallow os. Its working on Moto G 2nd gen. read carefully and try again. is not that risky for phone?? ?